Maintaining your oral health has never been more important since we now understand that oral health is directly related to your overall health and well being. This is why we encourage regular visits to our office for a cleaning and checkup at least two times per year. There are also additional things such as fluoride treatments that you can do to help prevent tooth decay and cavities. A message from your dentist in Washington, DC: fluoride treatments are important – and here’s why. It helps to re-mineralize damaged enamel, which can sometimes reverse the effects of tooth decay. Fluoride treatments at your dental office can also help to ensure that you’re getting the right amount of fluoride to protect your teeth. Switch to an electric toothbrush. It will do all the hard brushing work for you and ensure that you’re brushing for the full two minutes through a timer. Use an antibacterial mouth rinse. This will help give your teeth added protection against the bacteria and acids that cause tooth decay. Be sure to discuss with Dr. Obholz which one is right for your needs. Don’t forget to floss. 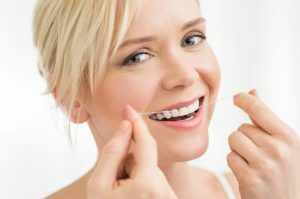 You should be flossing your teeth at least once per day. This removes plaque and food debris from in between your teeth. Did you know that you can actually get cavities in between your teeth? Eat more fruits and vegetables. This seems obvious, but did you know that fruits and veggies actually neutralize the acids in your mouth that cause cavities? They also increase saliva flow, which removes food debris and helps re-mineralize your teeth. At Aesthetic & Family Dentistry, we hope to be your life-long partners and mentors in achieving and maintaining your oral health for a lifetime. We know that prevention is the key to doing this, so we encourage you to call us today to schedule your next appointment.